My friend Tina and Mayuri said writing fiction is good for you. I decided to research the truth. Because a challenge is only good if it helps me grow .Right? Writing is a daily habit .But fiction ? When I started my blog back in 2014 ,this was never on the cards.Blogging in a vacuum ,I read other blogs and had no idea why they were widely popular. Some of them I frequent regularly,even now. Some a little less often.One thing I noticed. The blogs which I absolutely loved re- visiting had their owners stories, flavouring all their content. There’s a lot of debate about whether ,readers who visit blogs for information, want to read a story. Studies have shown that,blogs with a little storified introduction ,have better engagement than those that don’t . But it’s your blog you test what works. For me that is true.At Least now. So what does a nonfiction writer do ?Learning to tell a story is liberating .Tina wrote about how writing fiction is good for the creative mind. The body’s perceptions together with the brain’s interpretation creates a transitional state .That’s your mind.This is where you weave stories. For your mind to work ,you need both these elements to be in sync.I am passionate about Mental health . Creative writing is one of the best exercises we can do for the ageing brain. Neuroscience research shows that being a lifelong student ,is good for the brain – the “use it or lose it” idea. If the right brain helps you dream up ideas ,your left brain helps you put it in words. The different parts of the brain, work together to make a story.The more difficult it is to write,the more your brain is challenged. If it gets easier that’s a habit. Many people journal .That’s good too.But sometimes you are not ready to face the demons inside. That’s where fiction is a lot of fun . You can have real or imaginary demons.Plus have a lot of fun getting rid of them. This is the photo prompt for Week 2. “Look that’s the house in the map “ shouted Gina . The four children looked shocked at the ramshackle cottage .Half the roof was missing! “It’s broken down” ,Aruns voice pierced through their shock. “ The port key is somewhere inside that house ,I am sure “ said Gina again. The door hung from the hinges. Unable to even squeak. Entering they a saw a large log in one corner.They decided to sit on it and rest for a bit .The picnic lunch was waiting .They sat down. They had found the port key. I know a 100 word story is a little extreme for a novice like me.But I love challenges which make a positive change. After all we all love stories.Don’t you? Mayuri of sirimiri.in & Tina of tinabasu.com are hosting this amazing blog party . 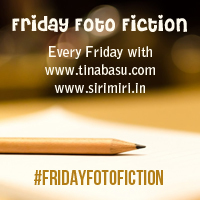 Thanks Tina.I am enjoying #Fridayfotofiction a lot . Kudos Amrita… I doesnt seem first time writing for fiction.. This sounds like a beginning of a great adventure!